Introducing the new Guess Connect smartwatch, powered by Androidwear 2.0. Customise your dial with over 100 combinations of display face, colour and sub dials. Pair with your iOS or Android smartphone to receive notifications and respond to texts, emails and more. Download apps from the on-watch Google Play store, co-ordinate your day using Voice Activation from Google Assistant and reach your goals with the fitness tracking features. 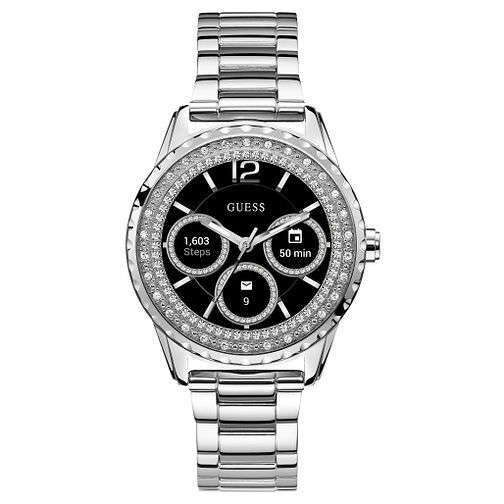 This Guess Connect ladies' smartwatch features a 40mm polished stainless steel case with crystal embellishments and a polished stainless steel bracelet.